HONDURAS: DARK ANGELS F.A. 3-PEAT CHAMPS! 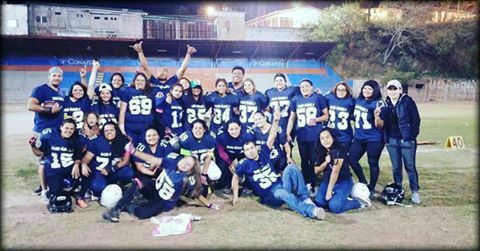 Season III of the Liga de Football Americano Femenina de Honduras (LIFAFEMH) in Spanish or Womens American Football League of Honduras under the banner of the Federacion Nacional de Football Americano de Honduras (FENAFAH) opened on Sunday, October 28th, 2018 with four teams competing; Dark Angels F.A., BlitzKrieg F.A., Lobas F.A. and Queens F.A. The final on Sunday, March 10th at Campo Lempira Reina in the capital city, Tegucigalpa brought to an end the 2018-2019 calendar with the reigning 2x champs Dark Angels facing Blitzkrieg for the second time in a final. The inaugural final was set between Dark Angels and Lobas. The semifinal lead-up on Sunday, March 3rd set the stage for Blitzkrieg to reign above the Queens with a 8-2 victory advancing them to the final. Dark Angels would go to their last offensive drive before halftime and would not lose the opportunity to score once more with a nice 15-yard pass to player #13 Maria Fernanda Garcia who was already waiting within the end-zone. To finish Dark Angels sealed their shutout with a final touchdown. A short pass from QB #15 Camila Matamoros to #82 Claudia Vásquez who advanced 10-yards after catching the pass to score. The conversion proved incomplete. A triumphed win for the Dark Angels! A team that started with very few players, going around from field to field, without equipment suitable for each player. The third season was full of challenges, but also a constant struggle to be able to encourage each player not only in the green-blue team, but at the league level. We know we are missing a lot, but we are willing to accept the challenges that come in the future. Our greatest expectation is to continue cultivating the sport. To achieve a future league where in different parts of the country can grow. Also make history and leave the stereotypes created by society, encouraging our Honduran women to leave the everyday norm. It is a great pride for me being Head Coach of these great women who in fact are an example of constant struggle … "
Blanca Alejandra Oseguera O’Reilly, President of LIFAFEMH and DL & TE #77 Queens F.A. team.
" It is a project that has been growing little by little with the support of lovers of this sport in the country, every season it’s about improving things. empowered women without fear of contact find this passion and join this league. The vision for the league is to grow, professionalize the sport, have our own fields to play, spread the sport to new areas and gain fans to fill the stadiums. " The close of the women’s final brought the start of the men’s Tegucigalpa Bowl XII calendar sanctioned by the FENAFAH and under the Liga de Football Americano de Honduras (LINAFAH). Sunday, March 17th the current champions Centauros F.A. won with a 16-point score culminated from two touchdowns, a conversion and a safety. Their rivals, Jaguares F.A. were edged out by only 2-points, scoring two touchdowns and one conversion tallying 14-points. The other game of the day was between Cuervos F.A. who sealed their first win of the season with one touchdown and a 2-point conversion against the Hurricanes F.A. trailing with only a 2-point safety. The Tegucigalpa Bowl XII has 6 teams competing in the calendar. Centauros, Cuervos, Huracanes, Jaguares, Lobos and Raptors. To learn more about the Honduras men’s and women’s leagues visit the links below. The recently established Asociacion Deportiva de Mujeres de Football Americano (ADMFA) in Costa Rica has announced the dates for the long-awaited women’s championship calendar commencing Sunday, October 7th at 9:00 AM (CST), Estadio José Joaquín “Colleya” Fonseca in the capital city of San José. The women’s league currently consists of 4 member teams although 3 will play in this calendar. The newest team to the sport, the Bulldogs FLAMES F.A. led by Head Coach Charlie Avila began recruiting players earlier this year along with picking up a few seasoned players. The Flames will play in the inaugural game against the longest established team in San José, the GODDESSES CR F.A. led by Head Coach Danny Monney. Both teams holding weekly practices in La Sabana Park near the National Stadium has certainly created a competitive rivalry that we expect to see in full force when they face-off on game day. The other teams currently in the women’s league are the VALKIRIAS F.C. led by Head Coach Martin (Pana) Gutierrez that represent the Canton of Pérez Zeledon and the Codea FALCANS F.A. led by Head Coach Lenny Vega for the Province of Alajuela. Although the latter team is not participating in this calendar. The Falcans will be ‘supporting’ the game from the annual Walk and Run for Cancer Awareness of the ROSS Foundation in another district of the city on game day morning. Falcans wished luck to the Flames and Goddesses teams. We’ll see each other on Sunday either supporting American football or fighting cancer! Information for live streaming of the game can be found at Yarda 506 TV on Sunday morning before 9:00 AM (CST) kickoff. The Valkirias will have their debut game when they host the Goddesses in Pérez Zeledón the following week on Saturday, October 13th.Playoffs will be on Saturday, December 8th and the Championship on Sunday, December 16th. All calendar games will start at 9:00 AM. Showcasing the rosters of the Flames and Goddesses in recognition of this historic game day for the women of American football in Costa Rica. ADMFA Logo/Link & 2018 Calendar has been updated on this web page since the original article published on AFI. Sports have the uncanny ability to lift the hearts of nations, even in times of civilian strife. What is even more transcending than the sports themselves are the unsung hero athletes who humbly move in stealth like fashion across continents sharing their cultural camaraderie; while at the same time sharing their unique sports’ knowledge and athletic skills to engage children, youth and adults alike helping to inspire communities for a better tomorrow. On February 13th, 2014 an unexpected email arrived in my inbox from Scott Schoettgen of California informing me that a 49ers Backup QB was coming to Costa Rica in two weeks as they we’re working with Glasswing International, a non-profit that does work all through Central America. Scott Schoettgen - On February 26th, we have a group of 5 football guys from the states coming down to Central America to coach some youth sports clinics in the schools, and renovate a school in El Salvador. In that group there are a couple guys who have played in the NFL, including McLeod Bethel-Thompson, who is the backup QB for the San Francisco 49ers. Ms Elle - As well do you have the contacts of the El Salvador American Football Presidents?… The IFAF league hosted the 1st Central American Bowl last September… The President of the IFAF league is El Salvadorian by birth but lived I believe most his life in San Diego! I believe you should connect with him. I can forward his/their contact info if you are interested. 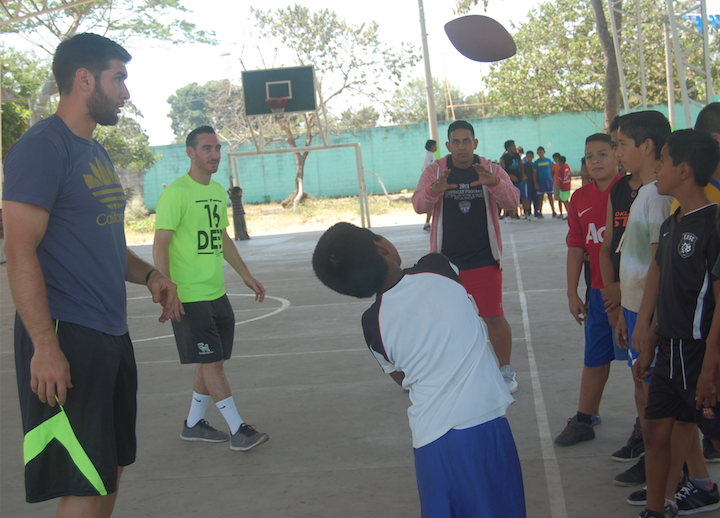 After the exchange of a few additional emails, Schoettgen and McLeod Bethel-Thompson were connected with Steve Agreda, Founder and Commissioner of the Salvadorian Association of American Intramural Football (SAAIF). Five years ago, McLeod established the non-profit Community Action Through Sports and Education (CASEProject) with five other executive team members; Cassady Bethel-Thompson, Scott Schoettgen, Burl Toler III, Tony Krikorian and Cameron Toler. McLeod was asked what motivated him to pursue El Salvador? I went to El Salvador as a child a couple of times to visit family. Always loved the country and the people. When I was going to Costa Rica to visit Scott (Schoettgen) I knew I had to visit El Salvador as well. My auntie Mercedes Ilort connected me with Celina de Sola the founder of Glasswing International and that is where we did our first camp in El Salvador. It has always been said that sports transcend beyond borders, beyond cultures, beyond politics. CASEProject recognizes while there are many countries and communities in need of support, CASEProject has specifically chosen El Salvador as its primary target area. El Salvador has fallen victim to some of the world’s highest levels of poverty. Like many regions plagued by lack of resources, gangs and violence flourish while educational systems suffer. The children of El Salvador are continually exposed to these pressures with minimal sustainable support. Without alternatives to gangs and with limited access to adequate resources, youth there have little choice but to repeat cycles of violence and poverty. CASEProject was created to address these issues - providing hope, training, and support to at-risk Salvadoreno youth and their communities - through the use of sports and education. Steve (Agreda) and SAAIF have been amazing and we continue to work with them every year. It has been hard to get down there because of the CFL season but hopefully we can make it again this year. His story, is one that people can resonate with here in El Salvador, being that he is constantly looking for an opportunity to succeed as an athlete whereby people here are looking for opportunities to succeed in life… both presenting constant obstacles. McLeod first came out to El Salvador in 2014… as an initial impact it opened our people’s eyes, just knowing that someone with Salvadorian blood was currently in pursuit of an NFL dream. McLeod has since come back on a yearly basis to participate in our annual Training Camps where he and CASEProject volunteers come out and put on clinics to help better athletic performance. He has hugely impacted our national level QBs with his tips and work development and we continue to collaborate with one another via email or WhatsApp messaging. McLeod was asked, what is next for CASEProject? As far as the next project for CASEProject we are a little bit unsure. We are in a bit of a transition stage. But we hope to return to El Salvador and connect with Steve (Agreda) and SAAIF as soon as possible. The Toronto Argonauts are a great organization with an amazing history. Being a part of last years’ Grey Cup championship was an amazing experience! I have never been on a professional team with a better group of men then the Argos. Top to bottom the team is made up of great men with good hearts. What a surprise it was for me to learn from reading a CFL article published on AFI in June just days before returning for a visit to my native country, Canada, after a 5.5-year absence that McLeod is currently a quarterback for the Toronto Argonauts (my CFL team since my teens!). Over 4-years since I last saw McLeod and his crew giving a football drills and skills camp to youth in San Jose, Costa Rica. Of course, I didn’t miss the opportunity to take in a home game on July 7th with the added bonus the Argos won! CASEProject is a 501(c)(3) charitable organization working to inspire and empower youth to bring positive change to their communities and environments. Past projects can be viewed here. SAAIF was founded in late 2010, with the first team San Salvador Caimanes taking the field in 2011. Since then SAAIF has grown to 8 male Contact teams, 10 female Flag teams, an annual coed Flag tournament that has seen up to 32 teams participating (15 person rosters). SAAIF currently has the Adult Men’s Selection “BIG BLUE” and the Women’s National Team “Liberty Hawks”. The men’s season is from June-November with the National championship “Nation’s Bowl” taking place in December. It was a wonderful day for me as I achieved my first touchdown! I felt very excited! Although that did not allow me to lose my concentration during the game. I thanked God for giving me the opportunity to score. I kept focused on the game, always thinking about the only thing I wanted, that was to win. I thank our coach Diego Morales and coach Jordi Melendez very much, for trusting in each one of us and always supporting us so that this team moves forward, and we take Masaya forward. The only thing I can say is that we will train harder, with more desire, with more sacrifice, no matter what pain, if we fall 9 times, we get up 10 and keep fighting until we achieve our goal. 1,2,3 TOROS … !!! " " Moving from one country to another is not an easy decision, it involves searching for a new school for your children, new house, new environment, etc. but finding one thing you love makes it way easier. American Football has been my passion for 19 years. I have been involved in the Asociación Guatemalteca de Football Americano (AGFA), National Teams Football and Flag, developing referees and one of my greatest achievements, creating TouchDown Academy, an academy for boys and girls that want to learn the sport. The first two games we lost, but gained the respect of all the experienced teams. At our third game the victory finally came, making all the talk, shouts and effort worth it. Toros de Masaya welcomed me as one of their own. Some of the Nicaraguan players have already been my friends since 2000, when we started the sport in the region. I am like in my second home and looking forward to start another TouchDown Academy to teach boys and girls from Nicaragua the great values of our beloved sport of American Football. " " The Nicaraguan football league started on April 7th with 5 teams. The new team Toros of Masaya joined the league for the first time with a lot of young players, competing with no experience but with a lot of positive attitude and effort. Since April, the league had to stop the calendar twice because of the problems with the national crisis in Nicaragua regarding the government and civilian situation. " Disclaimer… The information presented within this article does not necessarily reflect the opinions or beliefs of the LNFA, AFI or the author. The author is presenting the facts that have been established by various international news outlets. Over the past 7-years while promoting year-round American football in the Central American region, I have witnessed many challenges the leagues have endured and overcome to continue growing the sport. Their passion, determination, resourcefulness and tenacity has always, and continues to leave me awe-struck. Although for the most part, the dominant plight for the leagues has been extreme financial restrictions and acquiring equipment to develop teams. However, what our international American football family in Nicaragua has experienced in recent days, has put the privilege of participating in the sport outside of North America truly into perspective. The Liga Nicaragüense de Football Americano (LNFA), Nicaragua’s American Football League, has postponed its game schedule in the wake of politically charged protests in the streets. Multiple deaths. Dozens more missing. TV/Media censorship. A journalist shot dead on live streaming video. Use of excessive police force. Destruction of commercial and private property. Liga Nicaragüense de Football Americano (LNFA) is the ‘premier league’ comprised of teams from the federation league, Guerreros of Nicaragua (Guerreros, Aguilas and Toros de Masaya) and the private league teams; Iron Wolves and Lobos. The LNFA embarked on its 2018 national championship calendar just 3 weeks ago with the initial games hosted in the capital city of Managua. There was anticipation for the Week 3 Games to celebrate the growth of the sport outside of the capital city. As games were scheduled to be hosted for the first time ever in the town of Masaya, where the newest team of the league Toros of Masaya resides. On Monday, April 23rd, I discussed with Guerreros of Nicaragua, President, Eduardo Cordoba regarding the current ‘civil unrest’ situation and the affect it has had on the Nicaraguan American football family. Inquiring if Cordoba has concerns about being able to re-establish the league after the situation is resolved. IFAF, President, Richard MacLean, has already been in communication with Cordoba expressing his hopefulness and well wishes that both his family and the American football family remains safe and that the situation will be resolved soon. Nicaragua erupted into ‘civil unrest’ on the early evening of April 18th when alleged government-backed supporters and police began attacking the peaceful protestors of a reform imposed on April 16th by the Nicaraguan Social Security Institute (INSS), to litigate the deficit. The reform was approved through a ‘presidential decree’ with the main factors being a 5 percent deduction to the pension currently received by people who are already retired and already fulfilled their legal obligation while increasing the monthly deduction rate from workers paychecks and introducing a new formula to calculate pensions. Later that same evening these “supporters”, apparently protected by the police, began attacking the Central American University students on campus while vandalizing property and forcing students to evacuate. On April 19th classes were canceled for most, if not all universities across Managua while students continued to ‘peacefully protest’ the reform but only to be attacked again by these “supporters” again allegedly aided by the police, to counter protests. As day turned into night police enforcement escalated from tear gas and rubber bullets to beatings and real bullets while medical assistance for the injured, was reportedly denied by the government and medical supplies were being confiscated by police during vehicle checks en-route to the wounded victims. Many university medical students volunteered to treat the wounded even while fearing for their own lives. As well, a few local TV stations, not owned by the government were apparently taken off the air after broadcasting the demonstrations live and government-owned TV stations were airing news that seemingly contradicted the reality in the streets and what ‘civilian journalists’ were documenting and posting on various social media sites. Why the protests? The government has been accused of using the INSS funds apparently as ‘petty cash’ and for the presidential family. Although this reform was just the tipping point for an ongoing series of issues that have apparently oppressed the people of Nicaragua for years. On Sunday, April 22nd, the Nicaraguan people won their protest when President Daniel Ortega said in a message to the nation that the social security board of directors has canceled the changes implemented on April 16. On Monday, April 23rd, the streets of Managua were filled with peaceful protestors against government repression. On Tuesday, April 24th classes for university students were still suspended. 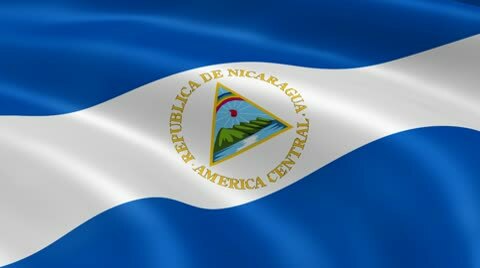 How all of this will continue to affect the growth and development of American football in Nicaragua remains to be seen. The LNFA has plans to resume play this coming weekend, provided that violence does not erupt again in this Central American country. Six Central American countries will be showcasing their men’s selection national teams at the Central American Bowl II in San José Pinula, Guatemala. The first Central American Bowl was hosted by the Salvadorian Association of American Intramural Football (SAAIF) in the city of San Salvador, El Salvador during 2013. Teams are divided into two groups, A & B. Group A: El Salvador, Honduras and Panama. Group B: Costa Rica, Guatemala and Nicaragua. The week-long tournament will open on Sunday, February 4th at 8:00 AM with Panama vetted against Honduras followed by Costa Rica vetted against home team Guatemala at 12:00 PM. Game day two will be on Tuesday the 6th starting at 10:00 AM with Honduras vs El Salvador and at 2:00 PM Guatemala vs Nicaragua. The third game day of the tournament will be played on Thursday the 8th with El Salvador vs Panama at 10:00 AM and Nicaragua vs Costa Rica at 2:00 PM. Only one game will be played on Friday the 9th at 2:00 PM to determine the 5th and 6th place between the third place teams of groups A and B. The game for the 3rd and 4th place will be played between the second place teams on Saturday the 10th at 10:00 AM followed by the final Mayan Bowl at 2:00 PM pitting the first place teams to fight for the title of 2018 Central American Bowl II champions! Marco Cobar Morales, Vice President, Asociación Guatemalteca de Football Americano (AGFA) and Central American Bowl II project manager. Eduardo Cordoba, Head Coach, Selección Nacional de Nicaragua. The venue for the action packed week-long tournament is the multi-sports complex Gatorade Arena. Juan Raskoff, President of Federación Nacional de Football Americano de Honduras (FENAFAH). to decline the invitation. This regret occurred while I was absent from my post as president for a few months because of personal reasons. For this Central American Bowl I have led a hard working national team of players that were carefully selected from tryouts. We expect to return to Honduras as a winner. " Selección Nacional de Futbol Americano de Costa Rica players are from the Asociación Deportiva de Fútbol Americano (ADEFA) Major League and sanctioned by the Federación de Fútbol Americano (FEFA). Big Blue Selección Nacional de El Salvador from the Salvadorian Association of American Intramural Football (SAAIF). Tigres Selección Nacional de Guatemala from the Asociación Guatemalteca de Football Americano (AGFA). Selección Nacional de Football Americano de Honduras from the Federación Nacional de Football Americano de Honduras (FENAFAH). Selección Nacional de Nicaragua from the Liga Nicaraguense de Football Americano (LNFA). Selección Nacional de Panama from the Asociación de Football Americano de Panamá (AFFP). Panamanians are psyched for the esteemed Panama Major Football League (PMFL) inaugural game of the 2017 championship calendar. Set for Sunday, March 26th at Estadio ‘Cascarita’ Tapia, Panama City, Panama. Kickoff 8:00pm. This kickoff game will feature the PMFL reigning 2016 champions, Panama Saints pair up against the USMA Frailes. The Panama Saints wrapped up the 2016 season with a 10-0 winning streak and trumpeted their triumph with a 7-0 shut out winning score of the final over the Panama Raptors F.C. Undoubtedly the undisputed ‘saintly’ champions of American football in Panama. The 2017 PMFL regular game season will be played over a span of 7 weeks encompassing 25 games leading to the playoff and final. Three regular season games will be played each week with the March 26th inaugural game, the playoff and final all being aired live on the Panama channel CableOnda Sports (COS). On Monday, March 20th the PMFL had its Week 1 debut of the 2017 championship calendar featuring the two teams Los Diablos F.A. vs. Panama Raptors F.C. With the Raptors taking the win 27-0. During January of this year the PMFL held its annual Combine and recorded a registration of 140 Panamanians whereby 70 were drafted on February 9th to the six PMFL teams Los Diablos F.A., Colon Eagles F.C., USMA Frailes, Panama Raptors F.C., Panama Saints, Club Wolfpack Panama. Ivan ‘Moto’ Paz, President of PMFL continues to lead the league at the helm while creating new opportunities for the players to showcase their talent. Paz recently announced that players will be able to look forward to a PMFL All Stars, Panama City based Cuadrangular Tournament in July. Other countries slated to participate; Costa Rica, Puerto Rico and Mexico. Four teams battled it out during the inaugural championship calendar of Liga de Football Americano Femenina de Honduras (LFAFH). The team Dark Angels F.A. secured the top seed going into the final with Lobas F.A. following second. The LFAFH championship calendar kicked off November 13th, 2016 and the long awaited final was played on Sunday, March 19th, 2017 at Estadio de Pelota Lempira Reina in the capital city of Tegucigalpa, Honduras. The final did not recognize a MVP however the LFAFH chose to recognize two of the best players of the year; QB Alejandra Michelle Aceituno Lopez #5 of team Lobas F.A. and QB Gabriela Molina #10 of Blitzkrieg F.A. The LFAFH is under the umbrella of the IFAF member, Federacion Nacional de Football Americano de Honduras (FENAFAH). “ Even though the first tournament ended there is a lot more work to be done. It was a very good beginning. We did have some minor complications and set backs but nothing that would stop us! growing women’s tackle football in Honduras to the highest level in the Central American region. Read how far Honduras has advanced in Women’s American Football. Honduras has proudly introduced the long awaited Liga de Football Americano Femenina de Honduras (LFAFH). The recently formed women’s league consists of four teams: Blitzkrieg F.A., Dark Angels F.A., Lobas F.A., and Queens F.A. The first game of the inaugural 2016-2017 championship calendar was held on Sunday, November 13th at Campo de Pelota Lempira Reina, Tegucigalpa, Honduras with Dark Angels F.A. shutting out Blitzkrieg F.A. by a score of 14 - 0.
and a conversion followed by #88 Fabiola Ramos. with a failed conversion attempt.
" After a decade of waiting for many women, we started a new stage, a new cycle in women's sport giving our first pioneers in American football a very pleasant feeling full of adrenaline. November 13th we had the first of many games to come. With the support of our brothers from the Federacion Nacional de Football Americano de Honduras (FENAFAH), Dark Angels F.A. and Blitzkrieg F.A. entered the field to give the maximum. The players all made the best of their efforts and two players in particular stood out: Dark Angels F.A., Katherine Suazo and Fabiola Ramos who were the scorers of this game in a sport that is our passion and in which little by little we continue to learn. " The Queens F.A. debut resulted in a forfeited game against Lobas F.A. because some of the players couldn’t participate as they were incapacitated with injuries sustained from playing in other sports. Therefore the team couldn’t complete the minimum roster requirement by LFAFH regulations. The penalty is a touchdown in each game quarter resulting in a forfeit score of Lobas F.A. 24 - Queens F.A. 0. After having to reschedule the week 3 game to the following week because of a stadium scheduling conflict, the Queens F.A. had to regrettably forfeit yet another game. This time, the forfeit against the Dark Angels F.A. was for the same reasons as previously in Game 2. The resulting forfeit score of Dark Angels F.A. 24 - Queens F.A. 0, was in accordance with the LFAFH regulations. The league closed out 2016 with a game held on Sunday, December 18th. This time the Blitzkrieg F.A. reined in the win with a final score of 16 - 8 against Lobas F.A. Blitzkrieg F.A. players #95 Gladys Calix and #90 Claritza Láinez each scored a touchdown with #10 Gaby Laura for two conversions. Lobas F.A. player #35 Cristina Hernández scored both the touchdown and conversion for her team. Blitzkrieg F.A. outstanding player of week 4 QB #10 Gabriela Molina. Game 5 is set to take place on Sunday, January 8th with Lobas F.A. facing their first encounter against Dark Angels F.A.. The 12-week regular game calendar will wrap-up on February 26th with the semifinal game scheduled for March 5th, and the 1st LFAFH Championship on March 12th. The LFAFH has already begun developing a new team, Valkirias F.A. that is expected to compete in the 2017-2018 LFAFH championship calendar.
" As president of FENAFAH, I had been involved over the years with the establishment of the various leagues under the FENAFAH banner. I had heard from some of the women flag football players that they would like to play contact football. I than began the process, with my wife Flavia Raskoff, to form a team called Lobas F.A.. Shortly thereafter, I started to collaborate with Raquel Gómez who had already begun the process of developing the Dark Angels F.A.. Queens F.A. was formed with players from the Vikingas F.A. 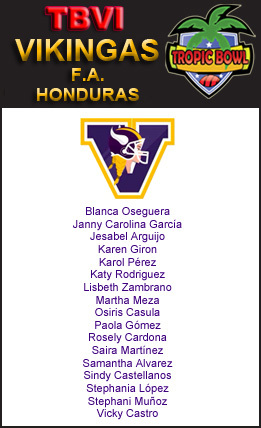 team who had previously played against the women’s American football ‘Costa Rica All Stars’ during May of this year. Athenas Castro was the driving force behind the creation of the final team formed, Blitzkrieg F.A. The four representatives of the newly formed teams scheduled a meeting with me, as being the president of FENAFAH, to establish the framework of the new league. We formalized the league and competition regulations, the election of referees and the championship calendar. I offered the teams my full support to make the first women’s league a reality! " The LFAFH has acquired the support of two Honduran organizations whose involvement has been pivotal to the success of the league. is an organization that rules all sport federations. The FENAFAH and LFAFH are recognized by the CONDEPAH. The organization assists with financial support to acquire uniforms and arrange venues to use for audiovisual clinics. The organization also provides temporary accommodations for the athletes, without cost, during specific tournaments. is a government organization that manages the stadiums and fields. The organization allows the FENAFAH and LFAFH the opportunity to use the venues at a very low cost or no cost at all. LFAFH has provided all the photographs/images for this article. Tropic Bowl, presented by Athletes Without Borders (AWB), is the longest-standing, internationally friendly, and annual American football event in Costa Rica. 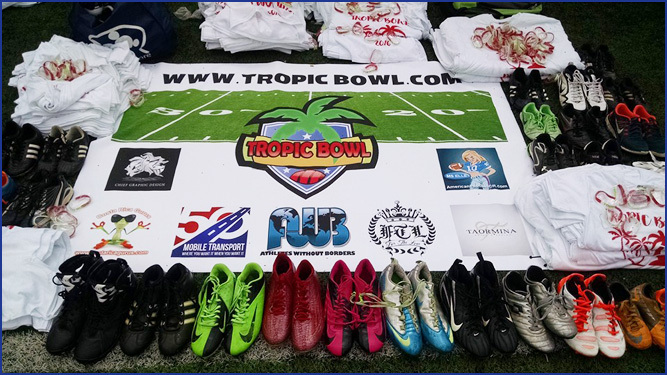 On Saturday, May 14th, Tropic Bowl completed its sixth edition at Ernesto Rohrmoser Stadium in Rohrmoser-Pavas, San José; a fitting venue for the vastly popular American football event, located only a few hundred meters from the Embassy of the United States of America. Each year, organizers of the Tropic Bowl have adapted the event day schedule to accommodate the ever-evolving progress of the local American football league(s) in Costa Rica. However the one constant that has always remained the same is the feature game of the North East (USA) All*Stars vs. Costa Rica All*Stars. The USA team is made up of semi-pro players mostly based out of the Massachusetts, Connecticut and New Hampshire areas. The Costa Rican team combines players from both the Costa Rican Federation and Private leagues. The Tropic Bowl is the only American football event in Costa Rica that doesn’t differentiate players participation because of leagues. Although the USA team has dominated the final score each year of the bowl, by no means has it deterred the feisty and fiercely proud Costa Rican players from welcoming the adversity of challenging their level of play against the USA opponents for the opportunity to develop technical skills. The mutual respect expressed by the players of both countries emulates the values AWB echoes. Head Coach, Carlos Avila of the Costa Rica All*Stars led the formation of the 40-player roster having had only two tryout practices before the anticipated game. Avila was accompanied by a locally renowned coaching staff; Offensive Coordinator, Paco Wilson, Defensive Coordinators, Kevin Brinkley & Evan Davis Jr. and Line Coordinator, Richard Compain. 1st Quarter: The feature game opened with Costa Rica having the ball, but not for long as USA LB Emmanuel Parent #31 made an amazing one-handed catch interception on the first drive. 4th Quarter: USA Backup QB Frankie Saxon #12 made a 27-yard touchdown pass to WR Nelson (Nelly) Montas #17 for his third touchdown of the game leaving the Costa Ricans defeated by a shut out score of USA 32 - CR 0. North East (USA) All*Stars MVP: WR Nelson (Nelly) Montas # 17 from Boston, Massachusetts, USA has been playing semi-pro football for nine years. 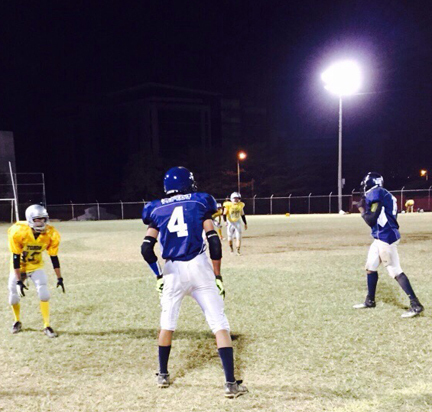 Costa Rica All*Stars MVP: QB Justin Mckenzie #2 also played QB for the championship team, BULLDOGS F.A. of the 2016 Super TazÓn CR VIII. the youths more than winning a MVP award. Thank you Costa Rica !!! " MVP: WR Nelson (Nelly) Montas #17 gave his jersey to a participant from the youth clinic. 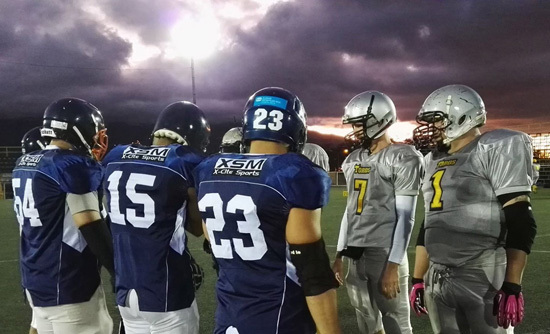 Last year Tropic Bowl V hosted the historic first exhibition game for the two women’s American football teams in Costa Rica; Pérez Zeledón - ANGELS F.A. & San José - Olympian GODDESSES CR F.A. ANGELS F.A. player Naomy Amador Atencio made the first touchdown for women’s American football in Costa Rica closing out the game 6-0. Fast track to Tropic Bowl VI, Head Coach, Monney took the women’s Costa Rica All*Stars F.A. (Pérez Zeledón - ANGELS F.A. & San José - Olympian GODDESSES CR F.A.) to victory with a 32-0 shut out win over the VIKINGAS F.A. of Honduras. Aiding at his side was Offensive Coordinator, Cisco Leon, Defensive Coordinator, Carlos Avila and Line Coordinator, Clifford Samuels. 3rd Quarter: 3 Touchdowns! Scoring action heated up when GODDESSES CR. F.A. players Floriam Vanessa Rios made a reverse touchdown run followed by Aymara Reyes Reyes reverse touchdown keep for 25-yards. A feat considering Reyes was still limping from a sprained knee only a month prior to the game. Women’s Costa Rica All*Stars F.A. MVP: QB Joselyn Ureña Retana #10 from the team Pérez Zeledón - ANGELS F.A. 21 year old Ureña has been practising American football for close to seven months. VIKINGAS F.A. of Honduras MVP: Janny Carolina Garcia #75 from Tegucigalpa.
" I like American football because it is very disciplined and represents courage and dedication. I became involved after I had attended a Pérez Zeledón - ANGELS F.A. practice and Coach Carlos Avila invited me to join this great sport! " The Tropic Bowl event opened at midday with a training clinic for youth and women focusing on Quarterback, Offensive and Defensive drills. Sponsors donated cleats and t-shirts to the participants. Tropic Bowl II and I not archived. Federación de Fútbol Americano de Costa Rica (FEFACR), one of two leagues in the country, sanctioned the 2016 1st Division National Championship Calendar. Week 1 game day of the 2016 calendar, Saturday, February 20th, was played at "Cuty" Monge Stadium in San José and was acknowledged by the historic blood churning rivalry that is expected of Costa Rica’s most recognized gridiron turf teams, TOROS F.C., reigning 2015 National Champions and BULLDOGS F.A., reigning runner-up of the west division. Guts and Glory are always befitting words to describe these two highly competitive teams as the Toros F.C. hold three national championship titles and the Bulldogs F.A. hold four. Both teams are determined to win the Súper Tazón CR VIII on May 7th. It is an unspoken truth that players from both of these teams always leave their hearts on the field, be it victorious, or defeated. Their hearts beat to the rhythm of relentless blocks and breath gasping catches to the last play of the game as witnessed with the Bulldogs F.A. narrowly defeating the Toros F.C. 27 > 26. Doherty is one of three players still with the Toros F.C. from the first 2009 championship team. Player of the Game: Weiss concluded 14 carries for 147 yards, 10.5%, 2 rushing touchdowns (40 yards & 48 yards), 3 first downs,1 fumble lost and 1 interception. Kicker Eloy Chacon, an original Bulldog, has been with the team for eight years and is recognized as the best kicker. With his precision skill he has won games for the Bulldogs F.A. and the National Team of Costa Rica. Chacon just returned for this game after reconstructive knee surgery. He definitely demonstrated to his teammates that he has fully recovered and can now kick even further! The first game of the day was between the Cartago Leones F.C. vs. the San José Titans F.A. with the Leones F.C. topping the Titans F.A. 8 > 6. A third game took place at a second venue located in Pérez Zeledón with the newest team to the sport, Codea Falcons F.A. vs. Pérez Zeledón Predators F.A. The Predators F.A. shut out the Falcons F.A. 57 - 0. Click the team names to visit their Facebook profiles. Photos of the 4 Nations Tournament can be viewed here. Since the inception of 'organized' American football in Costa Rica during the year of 2009, the sport has seen its fair share of growing pains. Read the time line he﻿re for the history of American Football in Costa Rica from the mid-90’s to 2012. * Perez Zeledon PREDATORS F.A. * San Jose TITANS F.A. BULLDOGS F.A. vs. TOROS F.C. Cartago DRAGONS F.A. vs. Cartago LEONES F.C. Panama is set to compete against Brazil for the last remaining spot of the Americas qualifying round. So far from the federation, the reigning IFAF world champions, USA, have been fast tracked to the final tournament by default, and Canada and Mexico have since qualified. In light of the recent announcement that the IFAF 2015 Senior World Championship in Stockholm Sweden has been cancelled and pending relocation to the USA, the Qualifying Bowl organizer, IFAF member, Asociación de Fútbol Americano de Panamá, AFFP has reiterated that planning arrangements are still moving forward for the event scheduled Saturday, January 31st, 2015. The AFFP is extremely pleased and proud to announce that the venue for the Qualifying Bowl is the Estadio Ro﻿mmel Fernández G. This will be the first time in the history of Panamanian American Football that a game is played in the National Stadium. Guillermo Suarez, Head Coach of the National Team of Panama, President of the AFFP and Vice President of the IFAF Americas, had this to say about the recent World Championship cancellation in Sweden announcement. With just weeks away from the most notable American Football event ever to be held in Panama, Coach Suarez was asked what benefits does he feel this Qualifying Bowl will bring to the sport in Panama? 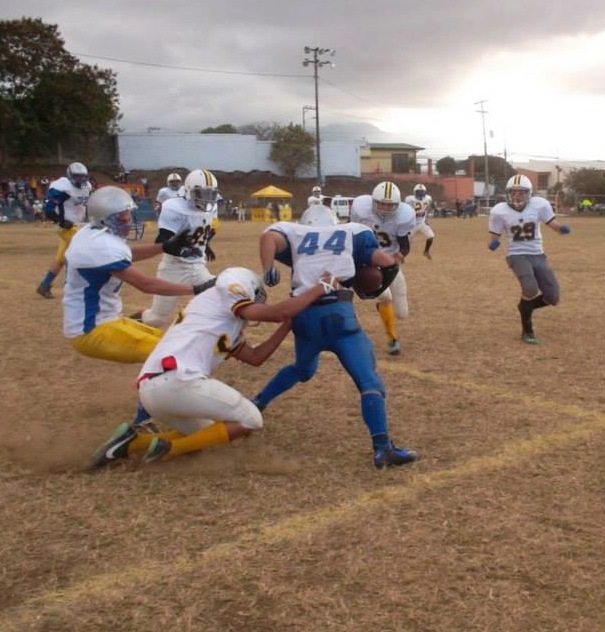 Regionally, during September of 2013, the 1st IFAF sanctioned Central American Bowl took place in El Salvador hosted by the IFAF member, Salvadorian Association of American Intramural Football, SAAIF. Five countries participated: Costa Rica, El Salvador, Guatemala, Nicaragua and respectively Panama. Honduras was invited, but unfortunately was not able to attend. 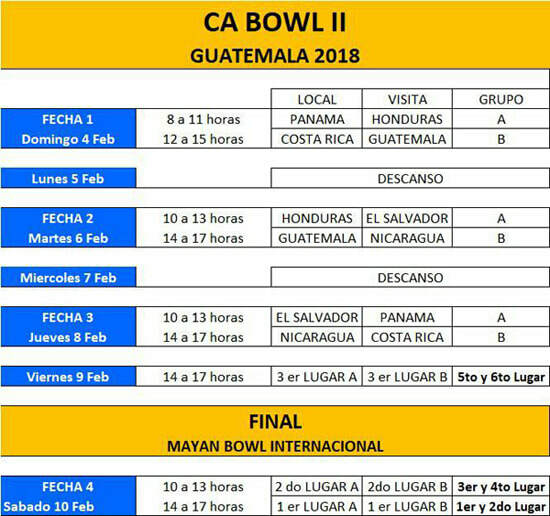 All of the participating countries agreed that the winner of the Bowl would go on to represent the Central American region in the upcoming IFAF Americas qualifying round for the 2015 Senior World Championship. Panama beat out Costa Rica in the championship game thus securing the honor. With an extensive history of coaching the national team since 1998, Coach Suarez as Head Coach of the 2015 National Team of Panama, has implemented strategic actions with the team since qualifying in 2013 to represent Central America. 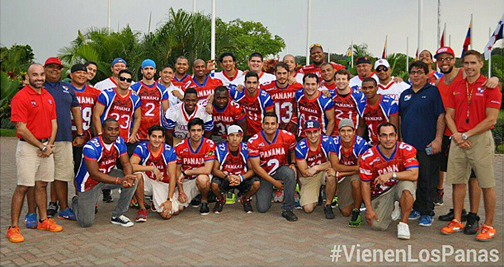 The Panamanian league has a number of locally recognized exceptional players who are expected to be on the final roster for the National Team of Panama competing in the Qualifying Bowl. In mid January, the AFFP will host a press conference to present the final roster of 45 players chosen from a pre-selection roster of 68 players. More in depth details about these star players, and the history of the National Team of Panama to follow in an upcoming article. This article is one of a short series of articles covering the Panama v Brazil - IFAF 2015 World Championship Qualifying Bowl, representing the Central American region. *Coach Suarez interviewed December 31st, 2014. Directions: Ave. Jose Agustin Arango, Juan Diaz, Panama.